Pratibimb is an initiative taken by the NGO – Goonj to get the urban children learn important things about rural India – the India they have never seen. 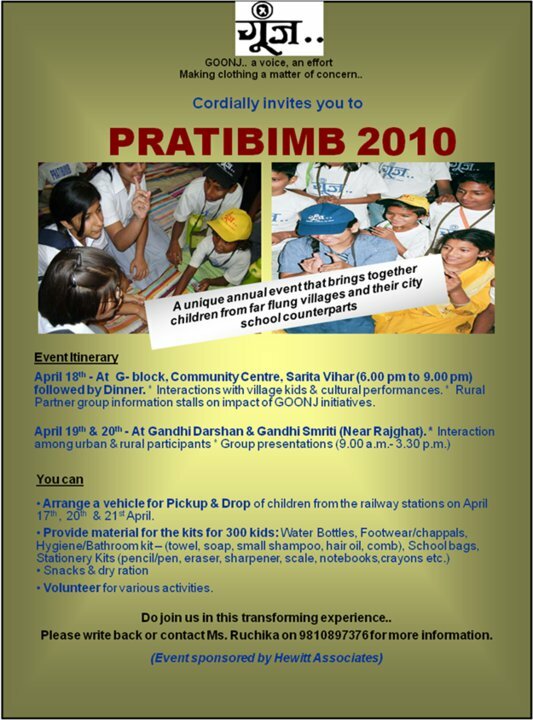 PRATIBIMB: Every year GOONJ organizes a one to one interaction event between urban and rural children to further cement the relationship between them as also to move them away from the bias led donor beneficiary mindset. The event has not only proved to be a great success, it has opened up many minds and become GOONJ’s flagship event. You can arrange a vehicle for pickup and drop from the railway stations for April 17th,20th,21st April. Do join us in this transforming experience.. The students of SMGS were active participants in this three days interactive programme organized by Goonj at National Bal Bhawan, New Delhi. On the first day, the children sat in mixed group of rural and urban schools. Group exercises and games helped to break the ice and soon the students starting conversing like old friends. There were about three hundred children from Assam, Bihar, Bengal, Kerala, Maharashtra and New Delhi. The students from rural India presented fold dances and songs and got a roaring response from the audience. The second day was about the ‘Seeking Solutions’ to problems faced by rural India. It involved presentations given by various urban schools. The students of St. Mark’s Girls Sr. Sec. School spoke about the problem of tobacco consumption in rural India. They presented several practical solutions to the problem with the help of a street play and met a very encouraging response from the judges. The third day started with an interactive session followed by a cultural programme. The third day session culminated with a Bal Sabha. This event proved to be a valuable experience for the students that opened their vistas of knowledge.